During the winter of 2007/8 I was preparing to make a large batch of top bar hives to move many of my Langstroth colonies to them in the spring of 2008. 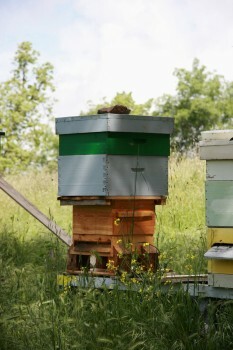 With modest experimentation during the 2007 season I found I much preferred the bees to construct natural comb. As well as being far cheaper (no need to buy expensive beeswax foundation)and interesting to observe, there were many biological factors indicating it would be preferable to let the bees produce comb in their own way. There is much worldwide debate on forums as to the benefits of smaller comb size in the fight against the parasite varroa and other bee ailments. When you let the bees free comb what we see are a greater variety of cell sizes. With foundation the bees tend to make the larger celled drone comb in any space they can to satisfy their needs. When let alone there is a smooth transition of comb sizes from workers to drone. Because of the importance of temperature for the brood, the physical distribution of comb and the different cell sizes will likely play an essential role the correct functioning of the colony. Temperature has been demonstrated to influence future activities of the developing larvae. This may be further complicated by larval development in differing cell sizes. (a nice view on the latter can be seen on Dennis Murrell´s (//bwrangler.com/ncom.htm) site. For sure there is a significant benefit for the colony’s welfare if they are in a cavity where the bees can lay out the comb to their own specifications and complexity. The comb is an important structural part of the organism/colony with far greater importance than a simple receptacle for storage and larvae growth. After over 30 million years of evolution of bees have tolerated only 100 years or so of the moveable frame hives heralded as a breakthrough in beekeeping and used today by most commercial and hobbyist beekeepers. In these the colony densities are generally far higher than found in nature, and subject to regular disruptive interventions. It is a testament to bees’ flexibility and resistance that they can survive and thrive under these abnormal conditions, and for that brief period of time (100 years out of 30.000.000 years) have allowed higher levels honey production by beekeepers manipulations. The advent of colony collapse disorder and the world wide problem with varroa and other stress related diseases has caused a significant hiccup in the industrialisation of the honey bee and many beekeepers are starting to look at alternative ways to keep bees without the use of chemicals to combat the ever more prevalent be ailments. We do not need to invent new methods, but just rediscover older techniques used effectively for centuries before the advent of movable frame beekeeping. The conclusions of Warre in the first quarter of the 20th century were found by 5 other prominent beekeepers in the eighteenth and nineteenth century (//warre.biobees.com/precursors.htm). At university I was lucky enough to have as my tutor Dr Lesley Goodman, who gently encouraged me towards bee research but which went no further than my final year paper on the effect of pheromones on conditioning in the honey bee. We had two WBC hives on a balcony on the second floor of the Biological Sciences block in London. After my Zoology degree 20 years have passed until in 2005 we bought a 1 hectare plot of land for our future home and I looked into how I could get bees involved with bees again. Although I thought I knew a fair amount about the physiology and behaviour of bees, I knew almost nothing of the craft of beekeeping. 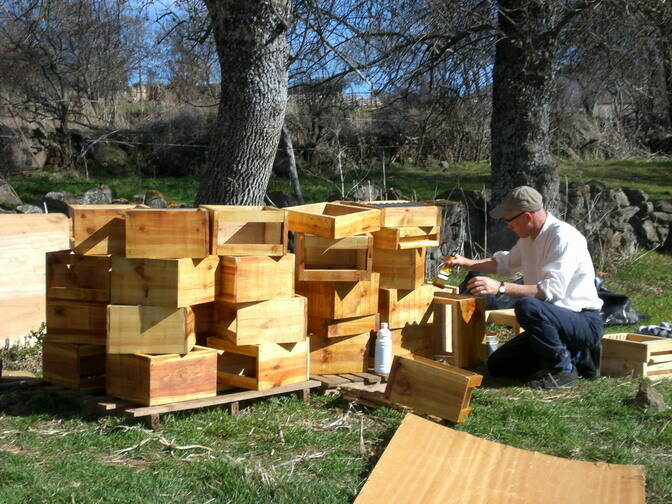 After reading a number of the standard modern works I purchased 8 colonies in Langstroth (what they call Perfection in Spain) transhumance hives and endeavoured to teach myself how to ¨work¨ these boxes. Those unfortunate colonies suffered far too many inspections and all sorts of manipulations. My woodworking began to be stretched by the huge number of bits of kit for the various manipulations. However, much as I enjoyed pulling frames and watching the bees and admiring the patterns of pollen, honey and brood, I began to think that by following these techniques I was often coercing the bees to behave and work in a manner contrary to their natural development. 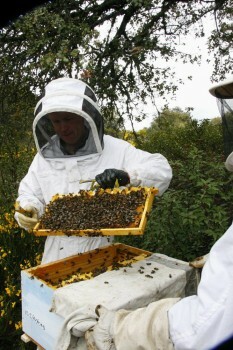 All standard beekeeping books have long chapters on a wide variety of method of preventing natural swarming. Yet, I found catching and observing swarms the most fulfilling aspect of all. (after my Snelegrove anti swarm method failed to work!). 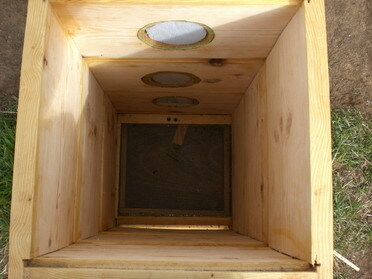 Also my Langstroth boxes needed plenty of scraping of the frames to remove propolis and burr comb. I followed the recommended cleaning routines to keep the frames mobile, but this was causing me a lot of work and the bees far more. Surely there was a good reason the bees wanted to reduce movement and gaps in their hive. 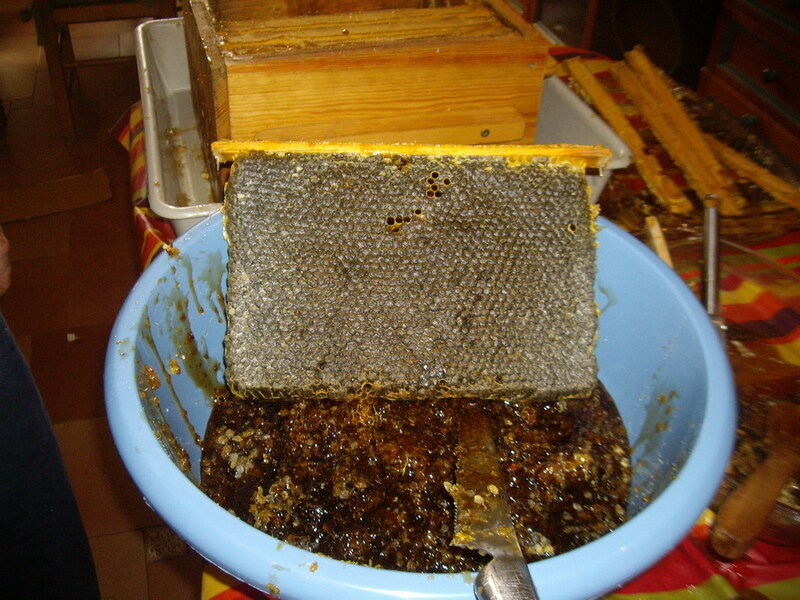 I began to be seduced by the top bar hive techniques and then during the winter of 2007/8 I came across David Heaf´s website and read his translation of Beekeeping for all by Abé Warre. 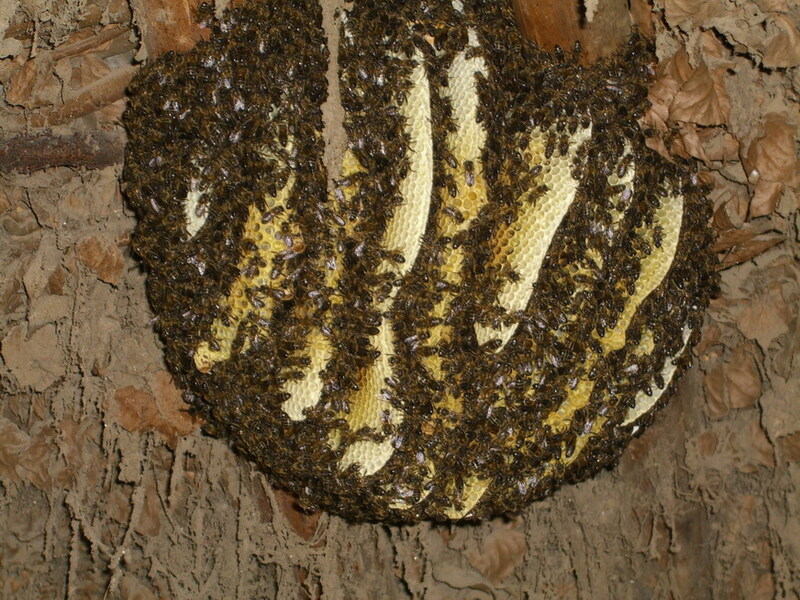 The Warre hive attempts to emulate the honeybee colonies natural nest site (a tree cavity). There are no frames and the bees build natural comb developing downwards as they would in a feral nest, rather than upwards; the direction demanded in most modern hive set ups. 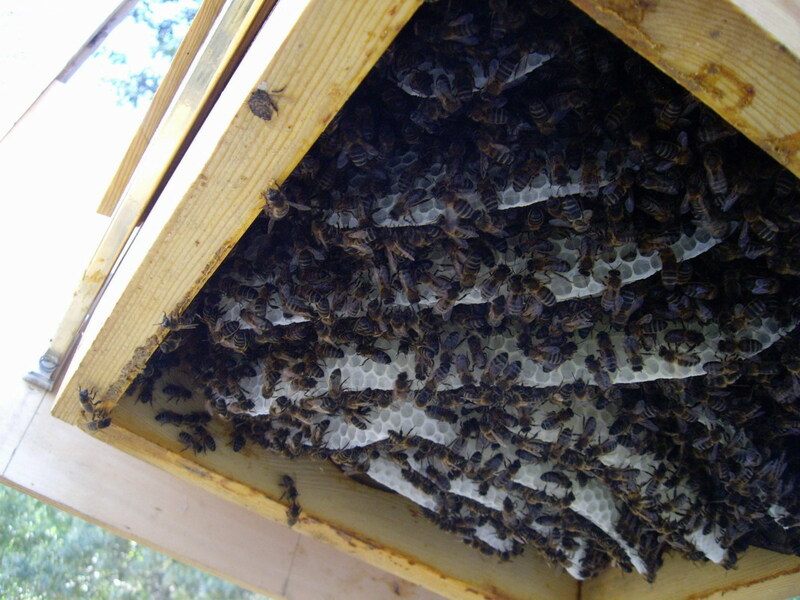 There is great emphasis on allowing the colony to maintain its correct temperature by using insulation above the combs and a narrow internal diameter. Intervention is kept to a minimum with the top being opened only once each year at harvest time. 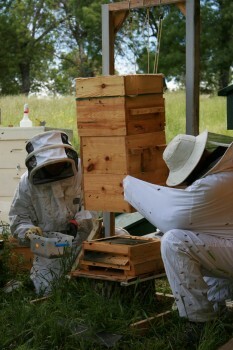 Another nice aspect of the Warre hive is that they are reasonably easy to make yourself. Robbing the bees of some of their honey at the end of the year feels more like a trade when you have personally made their home and taken care that it is well sited. I had over 20 hives going into winter at the end of 2007. With swarming and transference of stocks from the Lang hives I though I would need at least 22 Warre hives. As I have no garden or workshop then my first carpentry efforts took place on the street outside our house. Using hand tools and making plenty of mess and open to the gaze of passers by I struggled for weeks to get the first boxes to sit true. Our house is very old and was originally the home of a potter who would dry his work in the street and would probably have worked out in the street like myself (though for sure far more effectively!). It was much harder than I anticipated, and at that rate of production I would never get the 40+ boxes, 22 roofs and 22 floors made. I bought an electric table saw and set it up in the open air in the apiary field (which by then had electricity installed for the future house). The table saw and a new belt sander made a huge difference to accuracy and speed. 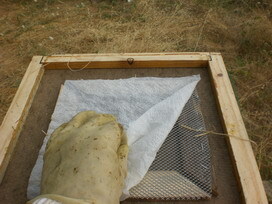 I wanted to incorporate an open mesh floor as I was reasonably convinced of their effectiveness against varroa. I was also distracted by trying various inventions for entry on the base, so ended up making a far more complex base than the original Warre specification but still closed below the mesh to maintain internal temperature. 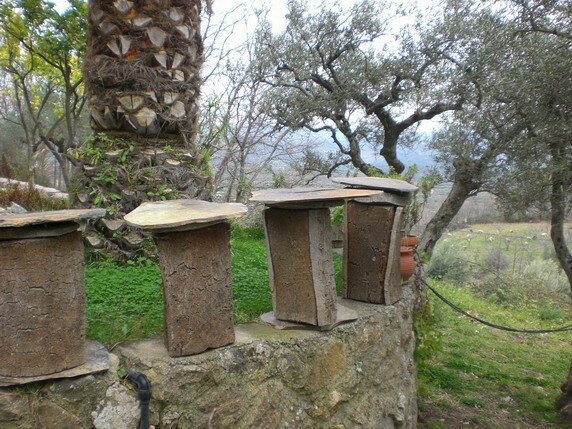 However, I did make a series of standard bases, notably for my Apiary in the hills 15km away which I visit irregularly and for which I wou ld not be able to keep the debri tray clean. January through to April in 2008 was remarkably sunny and dry (a huge contrast to 2009 so far). My open air workshop is set up at the top end of the field looking towards the south and the mountains. The hives were only 60 metres away and I was often visited by the bees whilst working, especially when painting the hives with a mixture of hot beeswax and linseed oil. Making regular trips to the local dump to scavenge timber for the build I came across some plastic drainage tubes which provided a quick easy and strong container for bait hives. These I painted inside with beeswax, smeared the entrance with propolis and topped with a Warre top bar grid covered by sacking and waterproofing plastic. The bottom was a piece of plywood, cut to size and stapled into the plastic. These and other boxes I started to hang in trees all over the valley in April in the hope of picking up swarms. At the local land fill I also rescued some old balloon style 16 litre glass bottles which would be useful for mead making later in the year. A day trip to Springtime conditions. Although only about 50km in a straight line the temperature and floral conditions there on the south side at 600m are dramatically different than here at our 1000m on the north side. 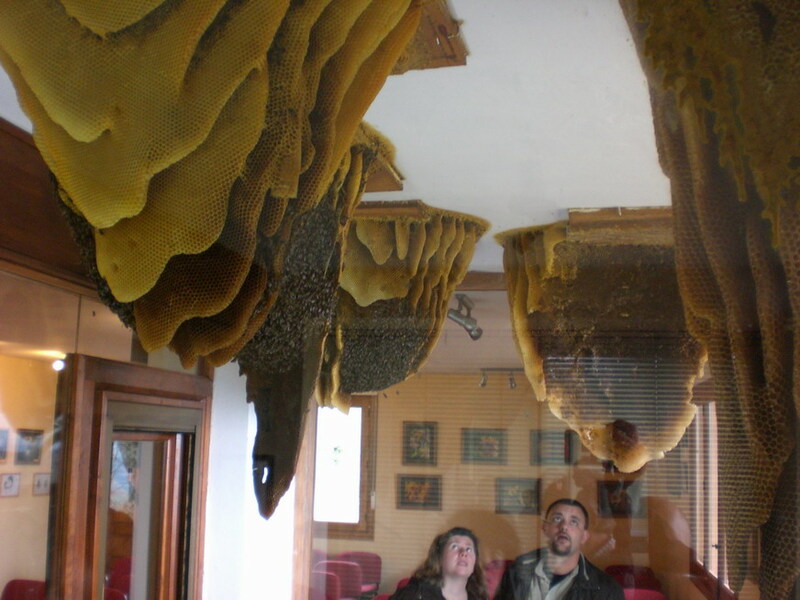 We made a visit to Abejas del Valle (//valletietar.com/museodelasabejas/) where Geraldo the owner has a number of colonies freely suspended from the ceiling in his ¨museum of bees¨. At that time in late February the bees were busily foraging on the abundant heather, whilst just 50km to the north at home my bees would have to over-winter for almost two month more before they could expect such abundance. In 2007 I had about 15 swarms issue from the first week of May until early June from my hives. Many threw off up to 3 casts, which was probably due to my stimulatory feeding towards the end of March. By April I had finished all my Warres hives, and was eager to get them populated. Most beekeeping books from the early 19th century onwards deal with how to move bees from the ¨primitive¨ fixed comb hives to the modern movable frame hive. In Spanish this is called Trasiego, and would be done from straw skep, or more often from cork, chesnut or oak vertical hives. What I was proposing to do was the opposite, moving my framed colonies to a fixed comb home. April is too early for removing the bees from their stores and home as there is still too little forage in this area and the temperatures can still drop below 5ºC. However, the bees start to get busy and are bringing in pollen and nectar so I hoped that by making a joining board and placing the Warré below the Langs (with the only entrance through the Warre), the bees might draw comb down into the Warre. 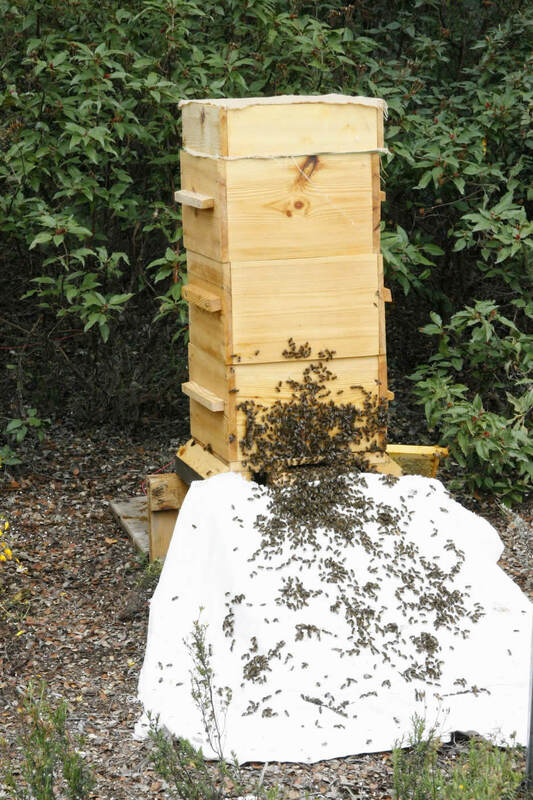 Driving the bees down onto this comb would then perhaps be less stressful for the bees than a total transfer to an empty Warre box, also providing the queen with space to lay straight away. However, this growth downwards was painfully slow. It was interesting to see large clusters of bees (through the window of the Warre) hanging down into the empty box. Sometimes a tight cluster would take up almost half the space of the Warre, but the next day would be absent and no comb had been build. The best indication that these clusters were involved in comb building was when freshly fallen white flakes of wax could be found in the debri tray below. At other times these clusters were perhaps playing some temperature regulation function. I made most boxes with windows. Some large rectangles right across the box similar to the method proposed by Jean-Marie FRÈRÈS and Jean-Claude GUILLAUME. A quicker method I found to be to make a round window, though the view was nowhere near as good as the rectangle. 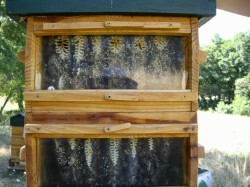 These windows have been well worthwhile is helping understand what is going on and when to nadir a new hive box. Also, when showing people the apiary it is far more interesting to show people the interior of the hive than just the activity at the entrances. As May approached I hung the last of my swarm bait hives (around 15 purpose made for trees plus all the Warres and old Langs around my field). Some of the Langs were growing down nicely into the Warres, but others were resolutely staying put up in the Lang. 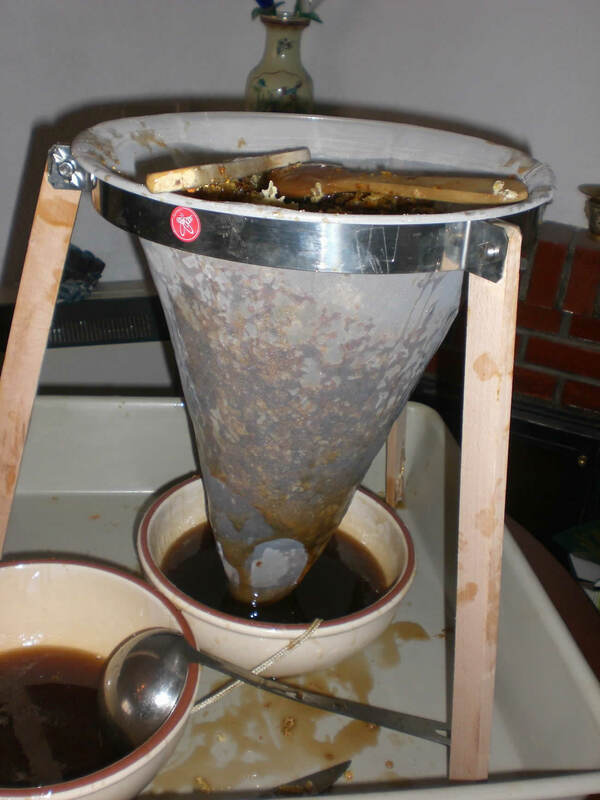 Following David Heaf´s example I made a metal funnel to shake down Lang frames into the Warre (from the roof of an old Lang) and the Hive lift similar to that used by Marc Gatineau. My version was made from scrap wood, pulleys and webbing from paraglider risers. I only got to see one swarm from my Hives at the beginning of June and that perched right at the top of an ash tree well beyond the reach of my ladder. It went within the day ignoring my many bait hives! May 2008 was the worse on record in Avila for over 100 years for rainfall and cold weather which is likely to have kept them from swarming. Any good day for swarming, with warm conditions and light winds I had to work on the mountain flying cross country with my groups, so had less chance of seeing swarms leave or catching them. My final tally for catching swarms in the bait hives was only two. 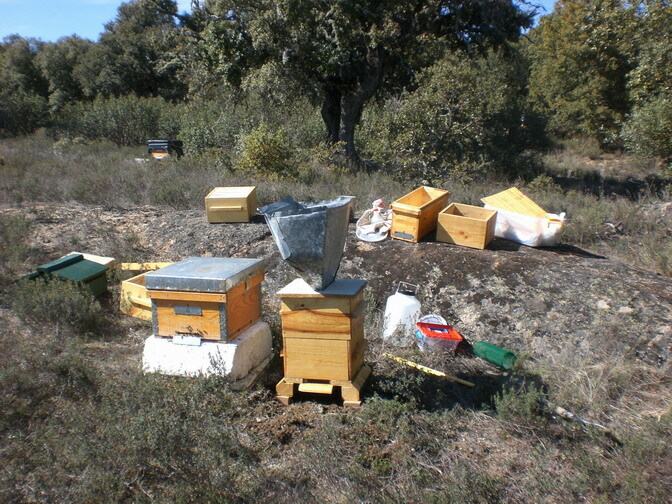 One in an old framed hive, and one in one of the drainage tubes I had adapted which I had placed in a tree between Villafranca and Navacepadilla. I really wanted to get the Warre hives up and running so decided that I would transfer most of my Lang colonies to the new Warres. This would involve driving all the bees out of the Langs, by shaking the frames either through the funnel into the Warre, or onto a cloth infront of the new Warres. The pictures above show the way I did it with colonies over a transfer board. The old queen and most of the colony went to the new Warre hive. The old langstroth with frames, brood, stores and covered with some bees were moved to another site. A bowl of cut comb honey, cut from some of the frames, was placed on the floor of the new Warre within an extra empty box with no top bars. 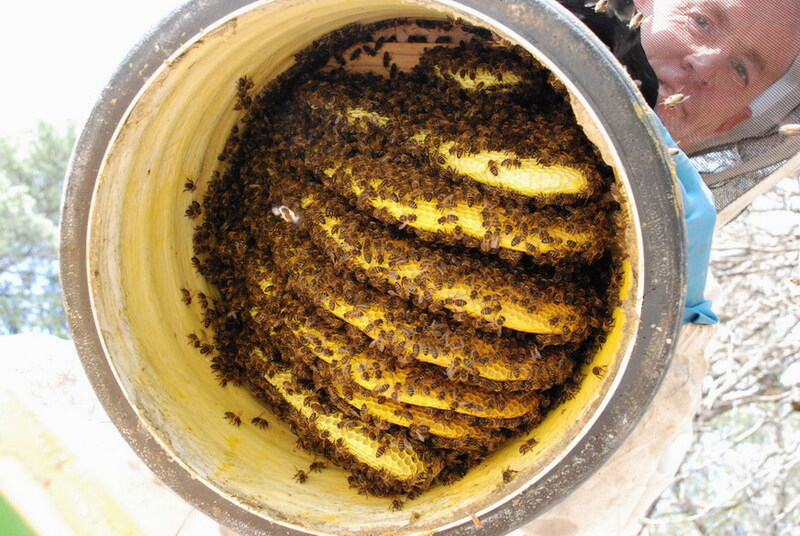 When this was used up the hive was lifted and the bowl removed. Later in the year those hives which had the lang removed when some comb (and brood) had already been made below the transfer board had a quite high level of Varroa. Langstroth colonies which I droves straight into an empty Warré without any comb fared much better as the brood cycle of bee and varroa mite was interrupted. Although spring was very wet, the summer was the usual hot and dry Avila summer. On the few poor paragliding days (wind too strong) then I often visited the apiaries to show our guests the bees and to check on their development. 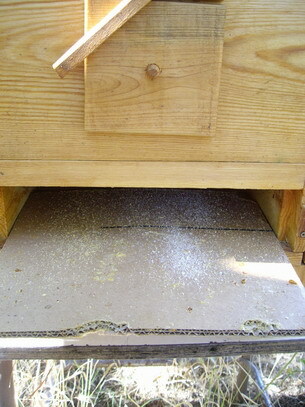 As the comb grew towards the bottom of the lower boxes, more boxes were added below using the hive lift. I never needed smoke for this, the bees remaining quite tranquil, and also I was able to examine the comb from below as well as through the windows. As is always the case some colonies flourished, and others grew slowly. Checking the back windows it seemed that in at least two colonies I would be able to harvest a box of honey that season. My paragliding work finishes at the end of September, so that is when I normally do the bulk of my honey collection. This is the only time of the year when the top is removed, when most of the bees are further down the hive with the brood. The honey is stored above the population, which acts as a heat sump and insulator. As the winter progresses the bees winter cluster will progressively move up eating the stores. We must be careful to leave sufficient stores above them to allow them to get though to spring and start their population build up for the new season. I made a clearer board, which later doubled as a formic acid treatment tray. 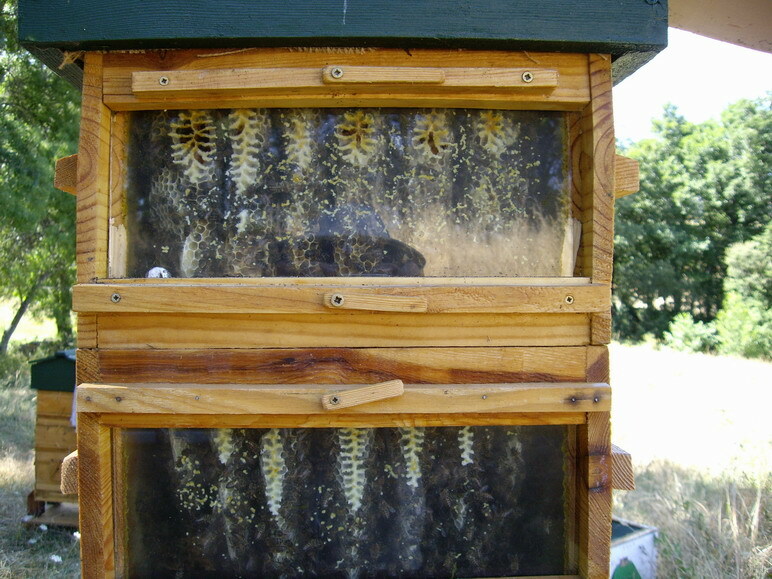 There was very little interconnection of comb above the top bars and after leaving for a day the removed boxes had fewer than 20 bees in them (these were brushed out with a Storks feather). 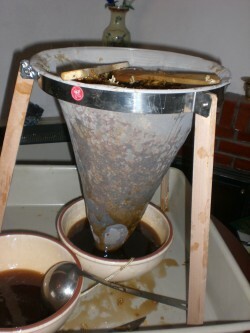 The extraction of the honey from the comb was by mashing up in a plastic bucket then straining through a fine conical sieve. This year I do not have a press, so there was a fair bit of honey still on the remnants of comb. This I fed back to the bees. What is nice to see is that the honey spun from the framed hives granulated quite early into the winter, whereas the Warre is only just starting to so. Some of the colonies were only partly developed in one Warré box, since they were the colonies from the Langs which had been moved to another site after having most of their number driven to a Warré in spring. As these were transferred mid summer it was necessary to give them some feed. This I did with standard plastic feeding trays and sugar solution above in September, and with feeding bowls and cut comb below them after their transfer. After removing the feeding devises and treating 3 of the hives with formic acid that was it for the year. I have 90 litres of various styles of Mead running from this year’s crop, but have used exclusively honey from my framed hives as I feel the strained Warre honey is too valuable for mead. Currently I have 11 Warré colonies which have survived the winter and are showing signs of strength at the entrance on warm days and bringing in plenty of polen. One of my Warré colonies has perished, leaving a full box of honey, and another I am monitoring as it has some entrance activity, but thay may be robbing from other colonies as there are plenty of stores visible through the window. It has been a very rewarding year of bee observing, and quite a lot of hard, though enjoyable work with the carpentry. I have been held back from starting this year’s production of hives as I have been building a traditional dry stone and thatched building. Its use will be for chickens, but I have a mind to build a traditional bee house used in Castilla y Leon which would be a similar construction. They were mainly to keep the bears away from the hives, but there are no longer bears in this area, so the project can wait a while. 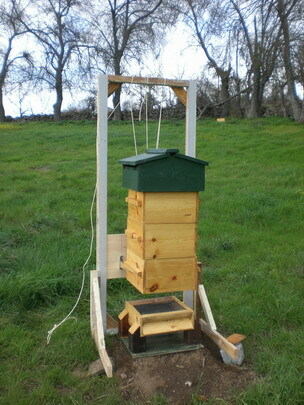 Posted: Monday, March 9th, 2009 at 23:05 by Steve in Beekeeping, Website updates. 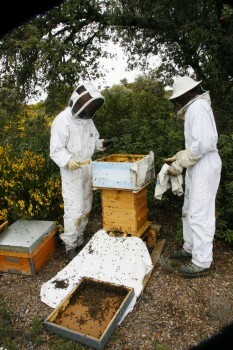 Your repport about one year with Warré beekeeping is like a Warré beekeeping course. My congratulations. I keep bees in Langs and TBH’s since 1983 here in Brazil. 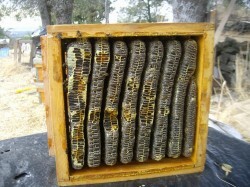 With one Warré hive I started in February 2009 and let the feral swarm in 2 Warré boxes each one with top bars. The bees are, at this time, only in the upper box. I read that the queen dont like to pass over a topbar to the lower box, specialy if the combs are not attached to the top bars of the lower box. 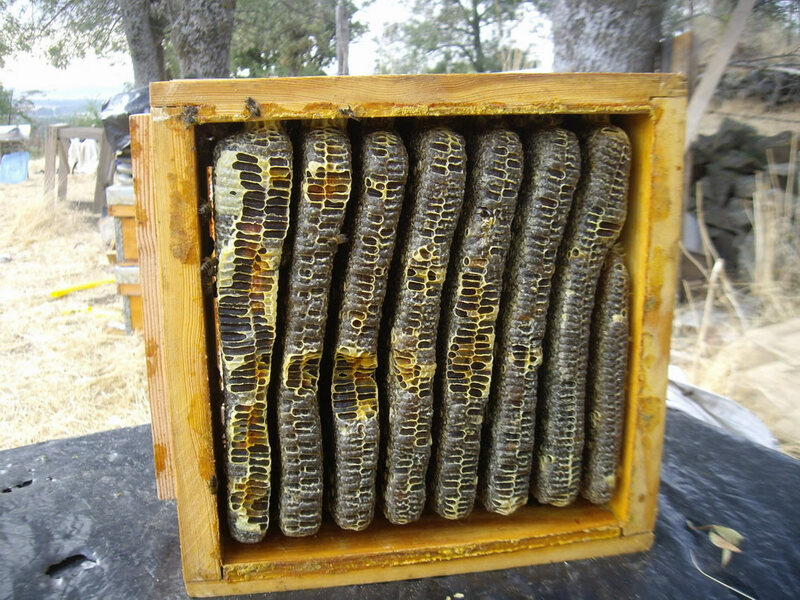 I dont know how my bees will proceed, but the next hive I will put topbars only in the upper box and in the boxes below only ” sticks ” crossing the interior to stabilize and hold the combs by harvesting the upper box. This procedure is like the japanese do it as you can see in the Syouichi Morimoto site. What is your experience or meaning about this ? Excellent work, Steve! 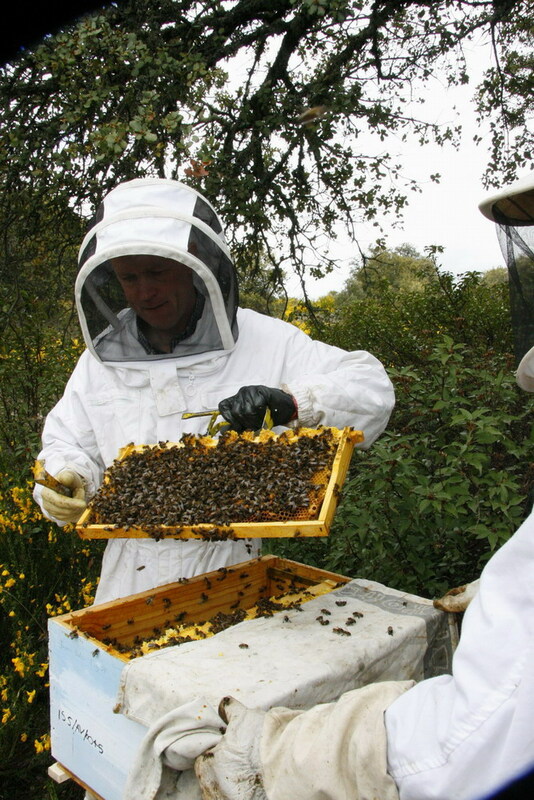 Great hives and a great story of your work with the honeybees. I think that the Warre hive makes for a more fulfilling beekeeping experience compared to the frame hive. I like your idea to use a clearing board to remove the bees from the hive. Where did you find your design to build one? What a wonderful testimonial for Warré beekeeping. I think you, John Moerschbacher and Dav Croteau, all of you having started your Warré experiment in 2008, had the best results of any, including myself who had a whole year’s start on you. I hope you do at least as well in 2009. I have yet to see a honey harvest from my Warrés although there’s plenty in some of them at the moment. Thanks for taking the plunge and joining in the fun, Steve! I thoroughly enjoyed reading your account on Warres and will be passing on site details to the few BKs I know are interested. The sceptics are watching to see if bees left alone in Warres can cope with Varroa. I note that you treated Varroa with formic acid; are you planning to leave any colonies untreated to see how they cope? You are one year ahead of me with warre’s in Spain albeit our climate very different. Your experiences here are a great help to me and I thank you for showing us them. My top heavy inverted Layens sat on warre boxes ended in disaster with the recent strong winds. Both of them ending up split apart on their sides. I have now transfered using other methods less precarious. May I ask you how you find communications with Spanish beekeepers? One final questin, what race of bee do you have? Mine are A.M. Iberiensis and are extremely defensive. Look forward to reading more of your experiences. Great site Steve (for flying and bees). Can I use some of your photos to illustrate the talk I will soon be giving about Warré Beekeeping? I think I will need you to email me the ones I want as the quality doesn’t seem to work if I take them off the site. Very interesting reading.i have just finished my first warre hive,but have also changed the floor to incorporate an inspection tray,i hope to get my first swarm within the next few weeks, im also half way through making a top bar hive as in biobees so i hope to get a swarm for that to . it will be interseting to compare the two. Ive made the whole warre hive 2 boxes roof and floor,and most of the top bar hive out of one sheet of ply £15 put together with staple gun and polyurethane expanding glue sticks like s–t to a blanket, and is totally waterproof ,plua a few screws where necessary , very quick and solid. Great site. Neat experiences. I’ve kept a few bees and am pondering doing a little para flying. 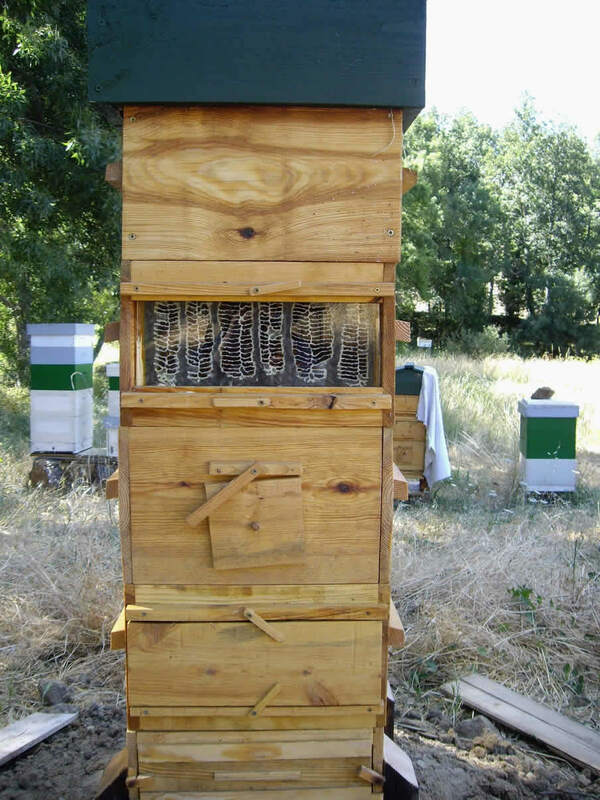 Your Warre’ hive is beautiful example. 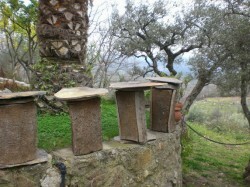 I would like to link to your site and use a couple of your photos on mine as examples of a Warre’ hive. I will give you credit. Would you give me permission? Looking forwerd to reading about more of your bee experiences this next season. Thanks for taking the time and sharing your experiences. Hi steve ,do all your warres have mesh floors? and do you think it makes a significant help to the varroa population? .I have just got my first swarm (all be it very small)and introduced them to my warre hive ,which they seem to have settled in very well, at the moment i have got a solid floor with a sliding panel as you had on some of your hives,its great for having a look at whats dropping out but not so good ,maybe for the varroa. A good experience getting the swarm ,i had to go to some ones house a few miles away with all the kit, and extract them from a rasberry bush,went really well and only left a few bees behind, then into the warre where they proceeded to go straight to the top bars ,i also gave them a bit of sugar solution to help them on there way,so fingers crossed. the next swarm will go into my horizontal TBH, which has got a mesh floor and is a fair bit bigger. I am interested in learning more about warre beekeeping. 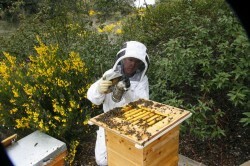 I live in South London ,work as a gardener and have some experience of beekeeping at a school in dulwich. Interesting reading your Warre experiences. My introduction to beekeeping was with my Dad with WBC and National hives, and only now 45 years later have I ventured to take it up myself! I’ve started with a horizontal top bar hive that I plan to populate next year and actively searching for suitable apiary sites in Pembrokeshire. I too am originally from the Bristol area and had my 1st hang gliding flights with the Fack twins at a small site near Glastonbury. Many more training flights continued at Mere under the direction of the Avon Club! Still flying hang gliders but now using a Doodlebug in the ‘flat lands’ of Pembrokeshire! Hello, I am about to get my first packages of bees and I too have been considering using the Warre Hives. I have built several Langstroth hives and one Kenyan style top bar and one Warre Top bar hive. 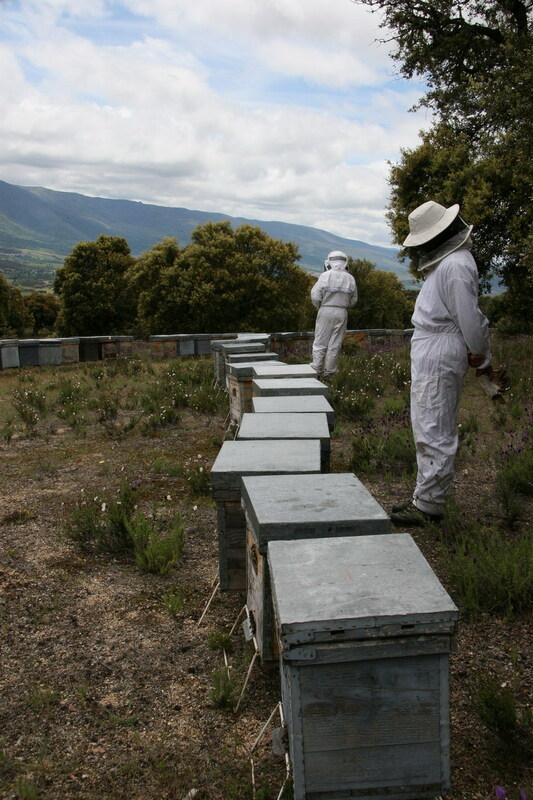 I have a question about the top bars in the Warre Hives. Are they just flat sticks without any grooves or starter strips? I do have the book on how to build the Warre Hive, but it does not go into any detail at all about the top bars other than their dimensions. Please help – my bees will be here soon! I was really happy to find this very helpful and informative page. Thank you so much. I am really having a hard time reading it though. The type is so hard to see against the black. I know how much thought goes into making an attractive and exciting page, as I’ve done a few blogs and individualized some of them. But if you could make the type larger and use different colors it would be really helpful. Anyway, I will go back up and highlight some of it to read. Thanks so much for sharing your knowledge. I hope to try beekeeping again soon and am trying to choose between Top Bar and Warre. I have found this site to be most informative. I have experience another solution to mite control that you may find helpful..
I’m just starting out with 1 Lang’ and 1 Warre. I plan to convert the roof of the Lang’ with a Warre-style roof and add a screen base. How else should I improve the Varro mites potential buildup? Thanks for all the information! I just finished building my first Warre hive and i am planning on making more. What material did you use for the window?? I never would have thought of that! I have just returned to beekeeping after an enforced break, and I have changed to 2 Warres rather than the Nationals I had for 30 odd years for the same reasons as you. -No update here for some 8 years… Must be a reason. I hope all is well with you and yours.